studio, it immediately feels like home. The smells, clutter, remnants, well worn tools, paint splattered table tops and crowded wall spaces are all old friends to me. I have arrived recently in Germany on a sort of sabbatical/ artist residency with my family. It wasn’t an opportunity just laid at our feet by way of personal invitation. (What a dream.) No, rather my husband and I felt compelled to pursue getting out of our usual surroundings, so as to open up space for us to rest, reflect, pray, refocus, and create as a family. God connected us with just the place to do this. Upon walking into the studio space we have the privilege of using while here, it instantly felt familiar and inviting. 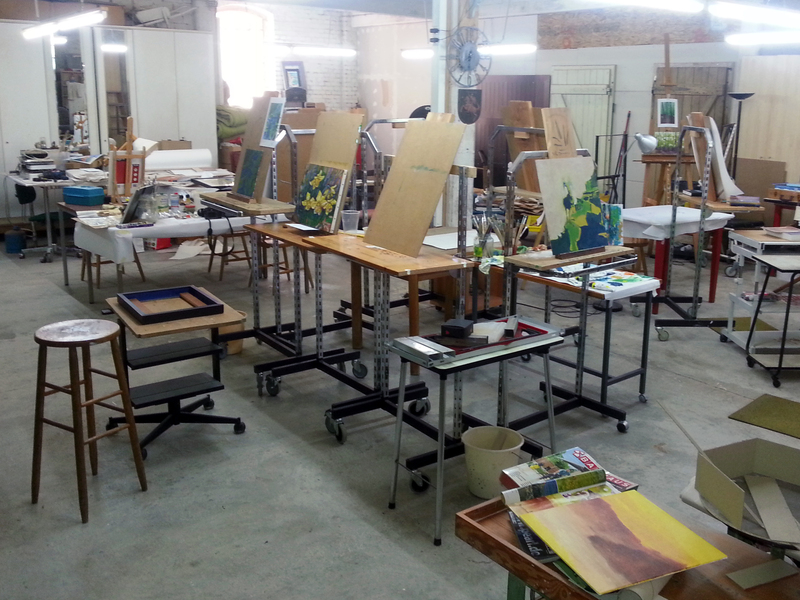 What is it about studio space that seems to resonate with artists the world over? It is as if there is this unspoken but understood grace in the space, as well as a unique humor. We spent the day setting up our temporary art creating home away from home. Now, if only there was an artist guarantee that what I end up creating here might actually be of some artistic value. Yet, I should shun the pressure and just begin faithfully occupying this studio space. I am grateful to have this space to create and already feel centered in this otherwise culturally foreign setting. As I began setting up I came across an old ARTnews magazine, (because what full equipped studio doesn’t have piles of old dusty art magazines we can’t bear to throw away) featuring an interesting article on the role of the Artist’s Studio: ‘Where the Art Happens’ Featured in ARTnews June 2010 by Ann Landi. This Production Site Project also showed an interest in “engaging with traditional ideas of the studio as an incredibly personal space, in which artists experience some of their most profound and devastating moments, a place where success is born and disappointing projects are discarded.” This concept was further supported by participating artist, Justin Cooper. I recognize that this is a chance of a lifetime for me and my whole family. I can’t wait to get started just ‘being,’ which I’m pretty certain will naturally transition into just creating.